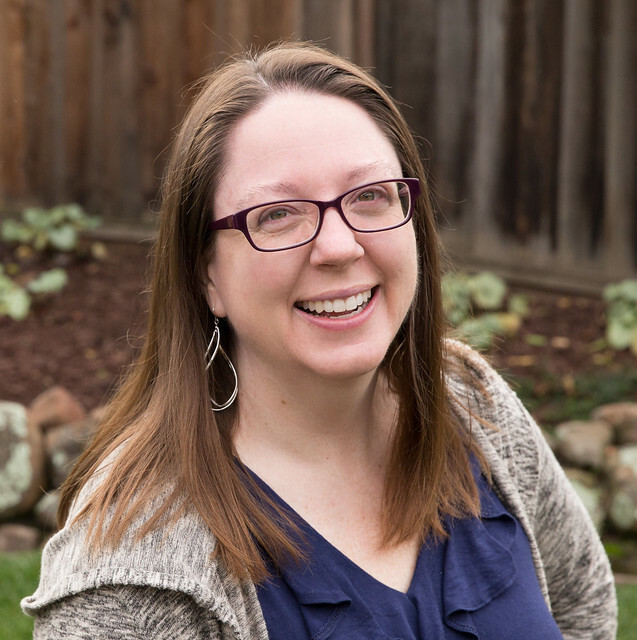 I'm thrilled to be here for the Wonderlust Blog Hop with Benartex. Paula Nadelstern's intricate prints and beautiful colors are a joy to work with! Her line is centered around four detailed prints in three different color ways – a kaleidoscope of colors. I chose to feature the Marbella prints, the blenders from her series. Check out the entire line of the collection. 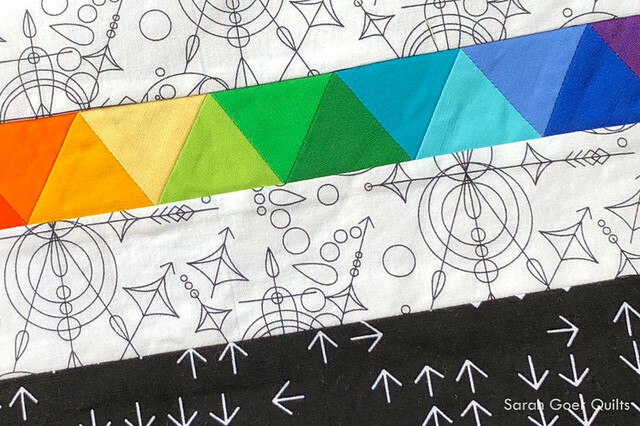 I auditioned a pile of different thread colors for my all over meandering quilt motif. Laying the thread over the different colored fabrics gave me an idea of how the thread would look once quilted. 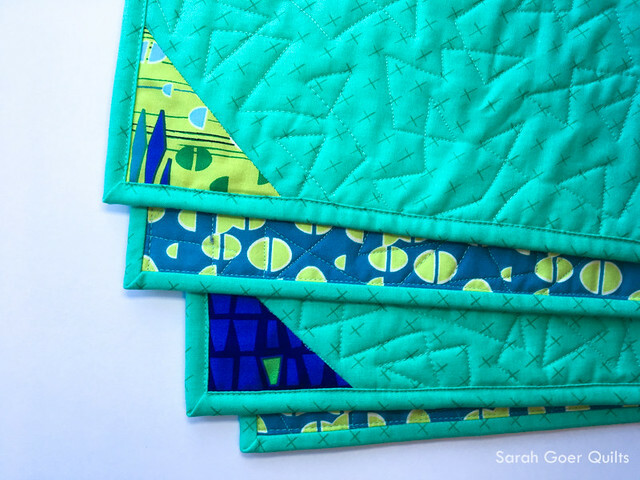 This was round two, and the Spring Green (Aurifil #1231 50 wt) won. The Spring Green thread blended nicely with the light fabrics and had a good amount of contrast to the darker fabrics. 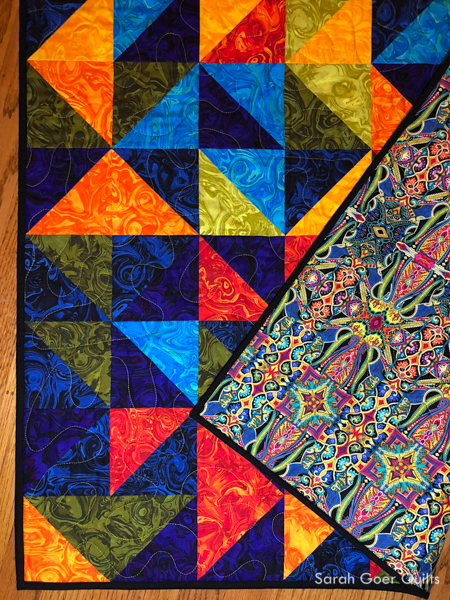 I love how it sparkles with the majority of lighter values in the upper portion of the quilt. 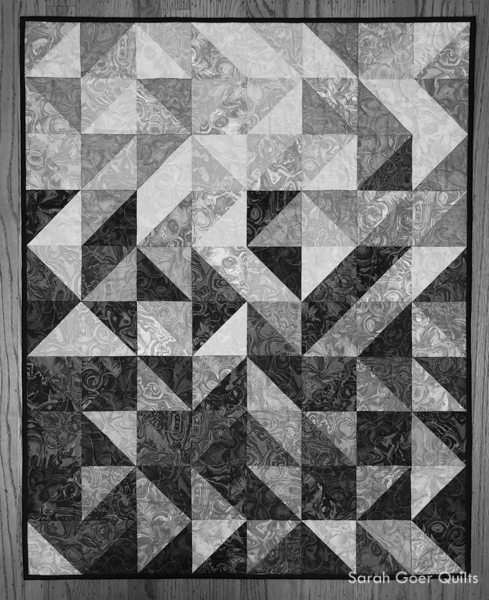 Below is the same photo in black and white to see the values of the fabrics. [Tip: Take a black and white photo of your fabrics to determine their relative values.] 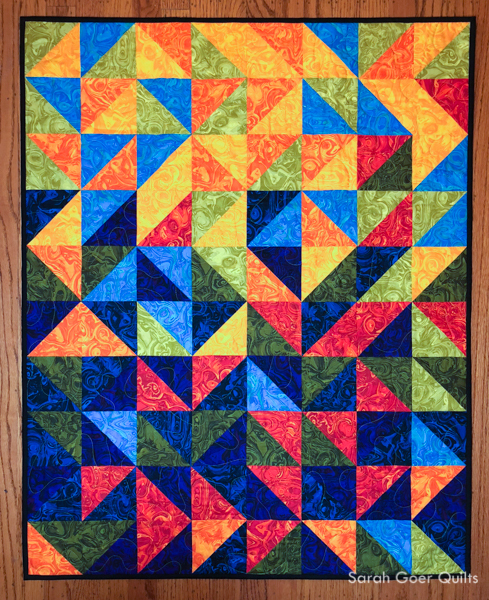 My quilt finished at 32" x 40". 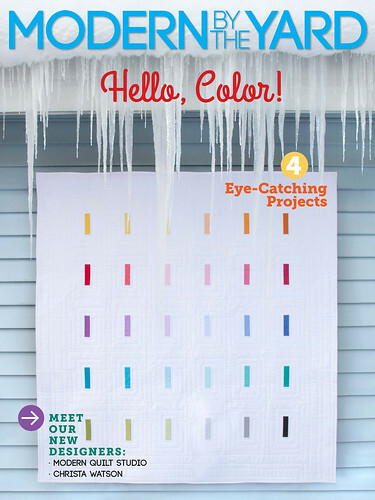 Be sure to check out my full tutorial for my Ombre HST Quilt. 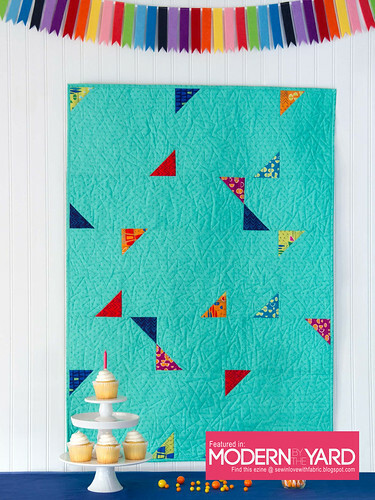 The tutorial includes a calculator for determining the size quilt which can be created based on starting square size. And my Craftsy shop has a coloring page for sale to help plan your project. My quilt is bound in solid black using my machine binding technique. 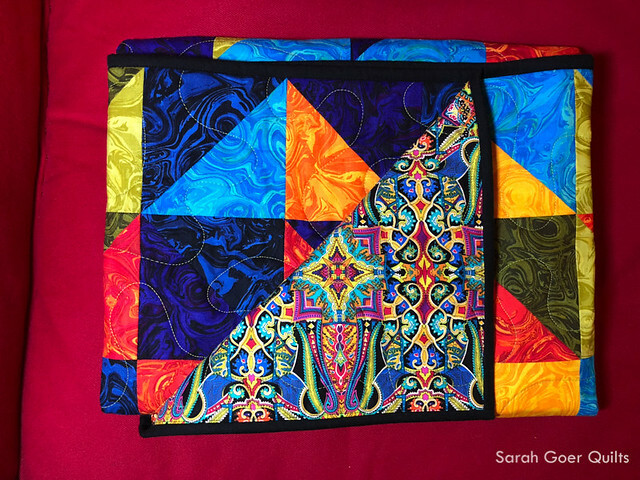 The quilt back is Tapestry in Multi, a perfect complement to the rainbow of color on the front! I love how happy this quilt is. For your chance to win a fat quarter bundle with a selection of 8-10 Wonderlust fabrics, leave any comment below (NOTE: If you've viewing on Bloglovin' be sure to click through to my blog to comment.). Newsletter subscribers can leave a second comment for a bonus entry. (Not a subscriber yet? Subscribe in the purple bar at the top of my blog, click to confirm your subscription in the email that comes to you, and leave a comment on this post telling me you're a new subscriber.) Entry deadline is 11:59pm EST on Friday, February 2. I will email the randomly selected winner and they will have 48 hours to reply with their (US) shipping address or I will select a new winner. EDIT: Teresa Knittingdancer is our winner! Posted in Quilting. 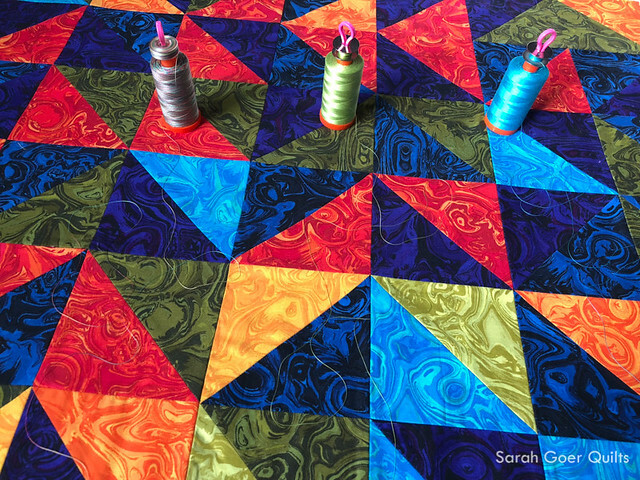 Tags: baby quilt, blog hop, finished quilt, Wonderlust on January 30, 2018 by sarah. 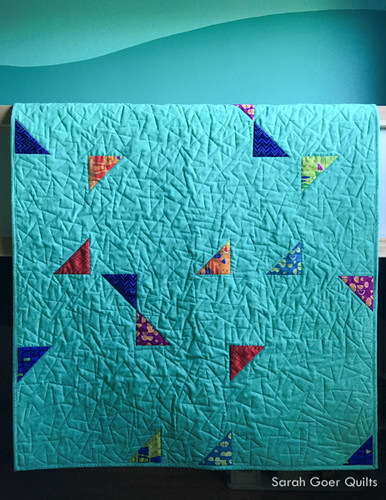 It's week two for Project QUILTING. Voting is now open. 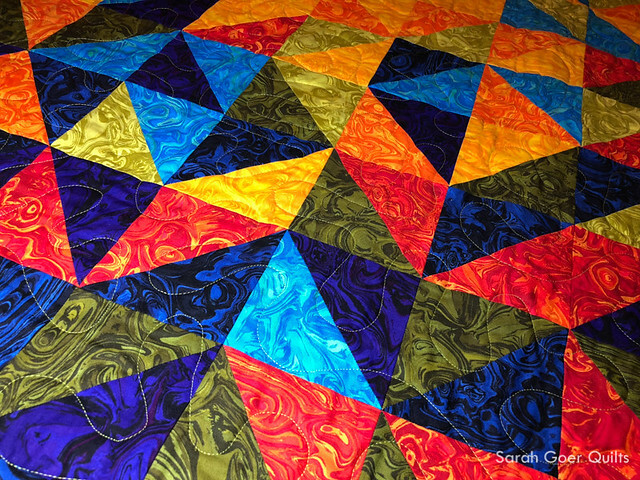 This week's theme of Triangulation has so many possibilities. So many that I think the options are a little overwhelming. Last challenge I made a list of about a dozen options and picked one. This week I just kept thinking about more (and bigger) possibilities. And too bad I didn't make this one this week! I've set myself some goals for my design work, and I'm trying to keep those goals and my plan to work small for these one-week challenges in mind when choosing my project for the week. I also happen to have another deadline this week. So, I had to keep dissuading myself from ideas that would be a bit too much work. I landed on some pieced equilateral triangles and decided to use them to make a small gift for a lovely friend who I was seeing today for her birthday. My plan was set by Monday night, and I finished my project with some late night sewing Tuesday evening. 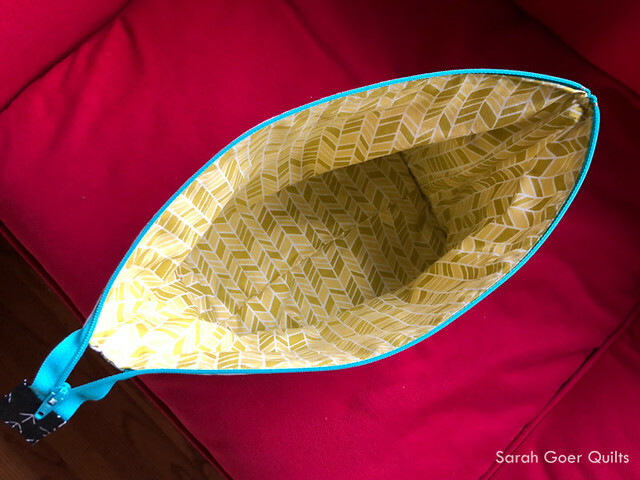 I decided to make the Noodlehead Open Wide Zippered Pouch. I've made it numerous times and it's a great tutorial and a fast make. For this challenge I decided I'd work in the triangles with piecing on the front of the bag. But then I got a little bit paralyzed with indecision with regards to the fabric choices. 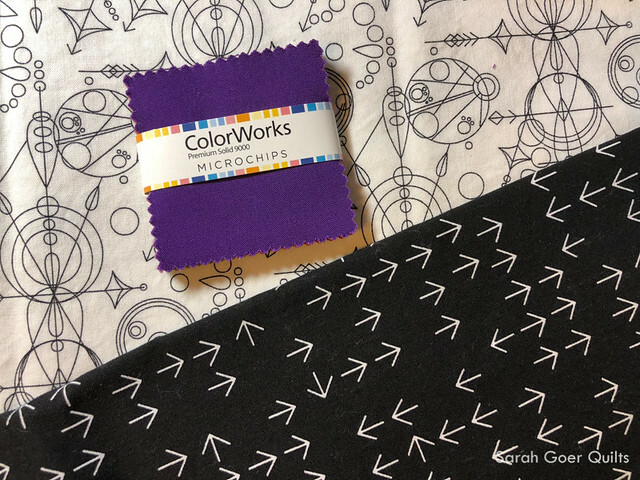 I decided this would be an excellent opportunity to make a small dent in my box of mini charm squares and chose this pack of ColorWorks microchips from Northcott, a giveaway I received at QuiltCon. I cut the biggest equilateral triangles I could from these 2 1/2" squares using the 60 degree angle on my ruler. They were about 2 1/4" on each side. 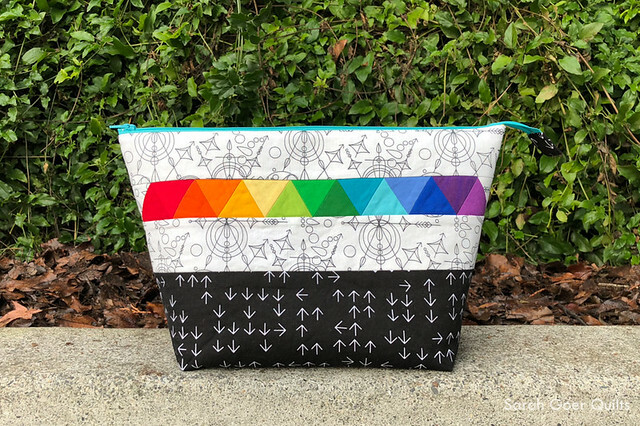 Once I decided to use the solid rainbow for my triangles, I easily decided on a couple black and white prints to pair them with. 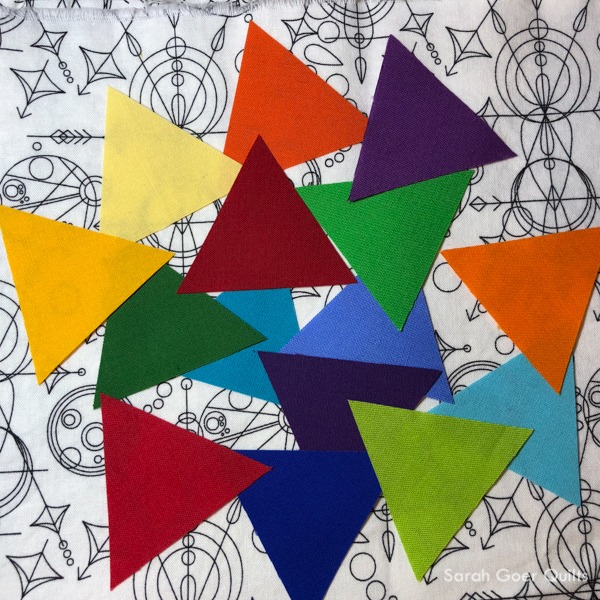 I arranged my fifteen triangles in rainbow order and pieced them in a row, adding my black on white print to the ends of the row so the strip would reach the full width of my panel. 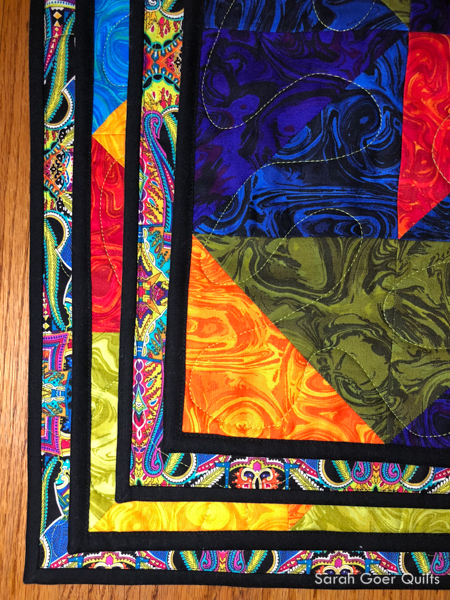 This is the largest size from the tutorial, and I like to line these big ones with fusible fleece, Pellon 987F (affiliate link), so they stand up nicely on their own. I chose a light print from my stash to line the bag. The finished pouch is about 8 1/2" tall and has a 14" zipper. It was pieced with 50wt Aurifil thread. Voting is open. Check out what everyone made and vote for your ten favorites! Mine is #16. Made in San Jose, California. Posted in Sewing. 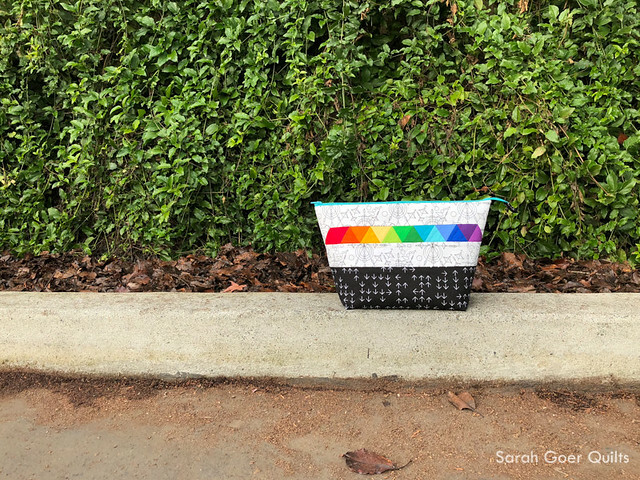 Tags: open wide zippered pouch, Project QUILTING on January 24, 2018 by sarah.